Teachers around the world sent Education World their favorite first-day-of-school activities. So here they are -- 14 great activities to help you get to know your new students -- and to help them get to know you. If you're looking for fun activities for the opening days of school -- activities that will help you get to know your students and help them get to know you -- check out these suggestions from your colleagues around the world. See also Getting to Know You: Activities for the First Day of School. The ideas are in no special order, and all have been edited for space. I've credited each activity as accurately as I was able to; in cases where I received the same idea from more than one teacher, I've merged those ideas and credited all. This activity is always fun, and we all learn something interesting about one another! I start. I write four facts about myself on an overhead transparency. Three of the facts are true, and one is false. Students take my little true-false test. Then I survey students to learn the results. We go back over each question to see what they thought about each statement. That gives me a chance to tell a little about me. Then, on a sheet of paper, students write three interesting facts about themselves that are true and one that is false. Throughout the day, I ask a few students to try to stump the rest of us. After the students sit and I take roll, I ask them to take out a sheet of paper and a pen or pencil for their first test of the school year. I explain to them -- in complete seriousness, of course -- that this will be the hardest test of the entire year because they have not prepared in class for the test. I have them title the paper "Teacher." I ask them to answer all parts of each question. The questions might include Where was I born?, What does my father do for a living?, How many brothers and/or sisters do I have -- if any?, How many different states have I called home?, Where did I go to high school and college?, How old am I?, What is my favorite color?, What kind of car do I drive? The test can be as long or short as you wish; make the questions fit the things you would want them to know. You can imagine the looks on their faces when asked these questions. I tell them they received their very first 100 in my class if they answered all of the questions correctly! At the end of the "test," I give the answers, and the kids marvel at the discrepancy of their answers. One of my favorite things to see is a student who was in my class the previous year. They always think they'll make a 100. They never do! With younger students, when they're right they think they can predict the future! Divide a bulletin board into "window panes," using white strips of paper. Create one window pane for each child in your class. Assign two children to bring in some object each day, such as a shell, that represents what they had fun doing this past summer. Put the items in small zip-lock plastic bags. After each presentation, mount the plastic bags on each child's "window pane." This makes a great back-to-school bulletin board and provides children with opportunities to talk about their summer. On the first day of school, read to students a popular favorite -- The Important Book, by Margaret Wise Brown. It's a wonderful, repetitive book that tells the "important thing" about a variety of things, such as a spoon, an apple, the wind, etc. After we read the book and discover its repetitive form, we write our own More Important Book. 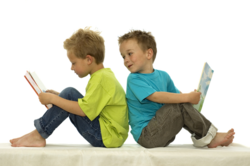 Each child tells about himself or herself, following the format of The Important Book." The children end, as the book does, by repeating the first line, "But, the most important thing about (child's name) is that he or she _____." Each child is responsible for a "most important thing" page, which becomes part of the class book. This is a wonderful and fun way to get to know one another, and the book is read throughout the year. I believe students are more interested in school when they have a hand in their own learning. I ask my sophomores to write a few paragraphs explaining what they would like to get out of my American government class. If they could teach the class themselves, how would they make it more interesting and what would they avoid doing? To get communication going between students who aren't necessarily friends, I start the year off with a game of BINGO. I make up BINGO cards for the students. Each square on the card includes a brief description. Examples: Visited Florida this summer, Is an avid waterskier, Has a big brother and little sister, Was born in another country, Lives nearest the school, Learned how to skateboard this summer, Didn't see the movie Titanic, Likes anchovies on pizza, Was born in the same month as you, Has a brother or sister in the same school, Favorite subject is science, Has an ear pierced more than once, Father's name is Jim, Read more than one book this summer, Speaks two languages, Has two pets. Students walk around the room and get the signature of someone who fits the specific description in each box. The goal is to be the first to student to fill the BINGO card with signatures. To make it harder, have students fill every square with a different student's signature and set a time limit. When a student has a BINGO (one name signed per square) give the person a small prize, such as being first in line that day. This is a great way to learn special things about your students and help get them to know one another. An alternative: Set this up as a scavenger hunt with a series of questions, each question with a line beside it. Students are given a time limit to circle the classroom and find someone who has "been there, done that." That "someone" writes her or his name in the blank space. Pass out BINGO cards to students. Each square on this card contains a question. (Click here for a sample card created by teacher Peg Teeter.) Have each student fill in the answers for ALL questions beside number 1. Wait for all students to finish. Then students find classmates with the same answers written in each box. The classmate with a matching answer prints his or her initials on line 2. Give a prize to any or all who get a BINGO! For the entire first day of school, I arrange all the desks in a large circle, with everyone facing the center. This makes it easy for the children to talk and get to know one another. Then I ask each child to introduce himself or herself. The children must also provide one fact about themselves. As we go around the circle, students try to repeat the information (names and facts) about each of the other students in the circle. This activity is intended to get high school science students thinking about the scientific process -- what is the issue or problem, what do we know, what do we need to know. etc. -- and to assess what areas of the curriculum are familiar to them. Issue texts, group students, and provide the following activity: Invite students to scan the first chapter of their text -- or the Table of Contents, which introduces major areas typically covered in the course. As a group, select a topic or related issue. Is this a controversial issue? That is, is there an ongoing debate related to it? Identify what you as a group know about this topic or issue. Determine what facts or information you as a group would like to know about this topic or issue. How would you go about answering the questions that you have just raised? Discuss in what way(s) this issue is relevant to you? After about 20 minutes, I stop the discussion and invite each group to share its responses. One of my objectives is to get the kids used to "true participation" and to the idea that being wrong can lead to being right! Playing Twenty Questions is a great tie-in to what I start class with the following day -- how sometimes we learn as much or more from being wrong as from being right. The game is easy and requires no set-up or materials. I choose an item in the room, and students have to guess what it is. They can ask only questions that I can answer with either yes or no. For example: "Is it blue? ", "Is it in the front half of the room?" The person who finally gets it gets to be the next yes-no person. I stress that that person would never have gotten it without everybody else's help; the "no" answers helped as much as the "yes" answers did. I also get to be a participant and to point out that sometimes I am wrong too! The tone of friendly cooperation on the first day lasts into the school year, and the first day becomes part of a lesson, not just a day of record keeping. Have children share facts about themselves by creating a Who Am I? riddle book. Students write four or five statements about themselves. The last line is a question: "Who Am I?" I put this up as a bulletin board and have students guess who each person is. The first person to guess correctly gets to choose who guesses next. Math About Me Students create Math About Me sheets. They share the sheets with the class and each student's sheet becomes part of his or her portfolio. The Math About Me information might include birthday, address numbers, phone number, sports number, favorite number, number of pets, number of people in the family, etc. When the students gather together to share their numbers, they see what numbers they have in common with their classmates, and everyone learns a little bit about one another. The numbers are then used to make a Math About Me poster. I take a snapshot of each child for the center of the poster. Then the kids design the math facts in a colorful, interesting presentation. We use these as a hallway bulletin board. After introducing yourself, create some chaos. Tell students they have three minutes to complete their first assignment: "Sort yourselves in alphabetical order by last name." After the initial shock and after they succeed, remind them how capable they are to handle their first day, and every day, by asking questions, getting help from others, working together, trying and evaluating strategies to "just do it"! Whatever "it" might be, they can do it! Students use colorful markers to write their names in big letters on a sheet of drawing paper. Under their names, they write several sentences describing themselves, for example, favorite things, family info, hobbies, and pet info. Then hand out blank puzzles (which can be found in craft stores -- cheap!). Privately -- perhaps behind a folder upright on their desks -- students illustrate on the blank puzzles the interests and information on their name sheets. They break up their puzzles and place the pieces in a brown paper bag with a question mark on the front. Post the large papers with the descriptive sentences on a bulletin board and, beneath that display, line up all the paper bags full of puzzle pieces. Throughout the week, during free time, students can choose a bag, put the puzzle together, compare the puzzle with the posted sentences, and guess which classmate it may be. At the end of the week look at guesses, and find out whose puzzle is really whose.